I find it interesting that I've been lumped in with others as an ed-tech insider. The difficult thing about these perceptions is that those on the inside likely don't know it. I remember Stephen Downes commenting recently that he's felt just like new bloggers may feel - likes he's not really invited to the conversation and as much of an outsider as anyone. In truth, I feel the same. What have I done to earn membership in any club? What have I done to earn any status? Maybe my job, maybe share, maybe speak up. But I've done nothing special - in my mind - to earn such distinction. Several weeks ago, as I argued back and forth with Jon Becker about why people should "step up" and sign up to present at NECC Unplugged, he correctly noted that I was teetering on the idea of there actually existing this notion of a cocktail party of ed-tech elite. To be honest, I can see both sides of the situation. 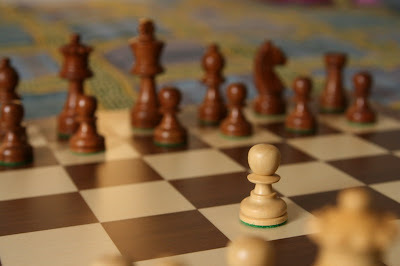 I feel like a pawn, caught awkwardly in the middle of two schools of thought. On the one hand, I can see how people may not feel welcome. I've felt that way before and I've forced myself to get over it, step up, and speak my mind anyway. On the other hand, I can see how this perception is just that: only a perception. Is there a cocktail party of learning? Sure, but the price of admission is nothing more than trust. Step up, speak your mind, create quality content, earn the trust of others, and you, too, will be as elite as any other passionate educator trying to do what's best for education. As I inferred yesterday: We're all on the same (small) team, hopefully fighting for the same cause. Can we care for each other enough to make this a success? The creation of the #dlist Twitter hash-tag is a publicly displayed example of how some people simply don't feel that they're in the same league as other members of our community.